Today I am going to share with you some amazing google account security tips. Some time ago google kicked in some amazing new features for all accounts. If you have a google account and you haven’t secured it yet? You should totally secure it because securing your google account is of extreme importance. Some days ago I wrote about how to secure your facebook account, if you had already read that, I bet it helped you, if you haven’t, I advice that you should. Every day our various accounts are liable to get into wrong hands, what makes us stronger against the so-called ”wrong hands” is our ability to secure our various accounts. These steps are what I used to secure my google account, so yes, They are going to definitely work for you. 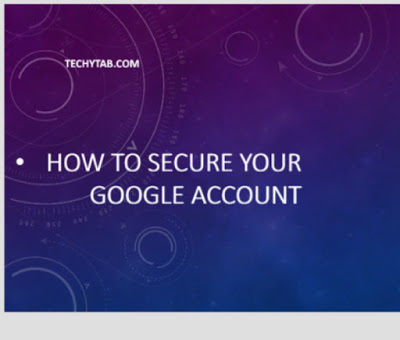 I and my team have put up a list of security tips for google accounts, that we tagged #Best google account security tips, these tips will definitely ensure that your google account is guarded. Now, of all the various google account security tips for your google account, many users seem to dump ”the recovery information”. This section in your google account settings is very I repeat, very important. In the event of ever losing your google account, you always have the recovery option where google will send you specific details via text for account retrieval. You will need to provide google with certain details in the ”my account” section. You will give information like. + A recovery phone number. You can however, use only the recovery phone number option, but I’d advice that you use all. Google will not use your contact details to send spam messages to you, they will only use the information you provide if they need to reach you about your account. Click on any of the recovery options you want to change. Another tip to keep your google account safe is to create a strong password, you should use a unique password for each of your important accounts. Re-using passwords is quite risky if someone figures out your password for any of your accounts? Maybe twitter or Instagram and it tally’s with your google account? That person would gain access to your account. You should also use a mix of letters, symbols, and numbers in your password. most people use easy passwords because they do not want to forget it, but trust me, it is better to forget your password and recover it, than for your account to get ha*ked. So it is time to be a bit geeky and step up your game, use numbers, symbols and a mix of upper and lower case letters for your password. For example, a seven character password with numbers, symbols, and mixed letters is harder to guess because it has 20,000 times as many possible combinations than a seven character password with only lowercase letters. Finally, do not use personal information like your birthday, example ”12november2014”, a password like that is easy to guess. you should use a hybrid password like ”pal128BIGBOY/[email protected]’‘ but be sure not to forget it, and do not write it down anywhere. An extra layer of google account security is added to your google account when you enable the 2-step verification. This verification really boosts your google account security. The method requires you to have access to your phone, as well as your username and password. The sweet thing about this is, when someone steals or guesses your password, they still can’t sign in to your account because they don’t have your phone. Of all the secure google account tips, you should try to activate this. —You sign in with two details, your normal password. — A code sent to your phone. If you would want to activate the step verification to secure your google account? Follow these steps. In the 2-step verification box on the right, select start setup. Finally, follow the step by step process for setup. When you are done with the settings and the 2-step verification is fully activated, the next time you try to log in, you will receive a text message with a verification code. Whenever you use a public computer to sign in, make sure you sign out, also clear cache, forms and cookies on your browser on a regular basis. If you notice any of the below behavior while using your google mail then it is possible that your google account is no longer secured. Some messages have disappeared without you removing them. Messages that you didn’t send appear in sent mail section. Your friends complain that you send them spam messages. Your account activity shows sign in activity at unusual times, and from unusual computers. There you have it, these tips will surely help you to secure google account. They are accessible from the ”my google account settings” section. As of today, google account security is a prerequisite for having your account all to yourself without someone else invading your privacy. if you encounter any issues with the above google account security tips, you can tell us in the comment section. Have you heard of the new google allo? From what you have said, My best guess is that your Google Account has been hacked, Sorry about that. Have you checked the other recovery options? Did you previously give Google a verification Email? I came across this thru searching Google which I have 2 questions. 1. I Ihave a friend that has a cell that dropped and won’t turn on. He bought a new cell. So last night I went to set up his new phone with his gmail account. He gave me a password he thought was it but it wasent. He didn’t have a backup email when he set up his account 8 years ago. So I was able to use my cell and went into my browser to go to the Google support page to see what I could do with hitting the Lost Password for his email. We tried to put in the month and year when he got his first phone for Christmas when he said he set up the account he used. But he had two different email addresses wrote down on another paper I found in his tablet but with no passwords. After trying different options I was able to somehow use my email address to have a text alert code sent or it was the page that showed up on my phone to hit ok that asked if that was his phone name and date which I hit yes. It then went to a screen to make new password which I made and then signed into his new phone. After it synched every thing he said it didn’t have all his contacts his old broke phone had. So I’m thinking those were backed up to his other account he had wrote down. So with it being late I told him to use it like that for now u ntill I can look online to see how I can get into that other account that he must of been the one he used on this last phone he had that isn’t starting up. Would u have any tips on how I could do that one? Also, I was thinking after I woke up today that I didn’t delete my email address I used for his recovery to get his account open. Now can I log into my Google account on my laptop to revoke my email beibg used for his recovery? Or would I have to use his phone to go into his accoubt settings to delete my email address?? And I was wondering if you have any how to videos about how I could make a new Gmail account and would I be able to use the new one to be used on my android cell phone so I can delete the google account I’m using on it now.